Since 1996 MBF Perry Company, now an Affiliate of Geiger, has been fortunate to have clients all over the nation. Over the last 20 years our team has cultivated long-distance relationships resulting in marketing and promotional product clients from Hawaii to Delaware, as well the Alabama business community. In March of 2016 we became affiliated with Geiger, the largest family-owned and managed distributor of promotional products in the United States which makes our commitment to your success even stronger through their buying power and technology innovations. Our Team Consultative approach ensures your success for your current marketing or promotion challenge. No matter your need, Our team will work with you to create and implement high-impact marketing programs to help you accomplish your marketing goals cost effectively and responsibly. . . As an affiliate of Geiger we combine ideas with creativity to create your own Brandspiration! Text, Email, Phone calls however YOU like to communicate…that is how we communicate with you…Your success your way! 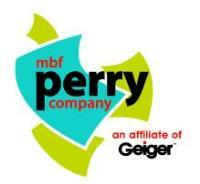 Co-founders of MBF Perry Company, Bill and Melanie Perry, believe in giving back to the community. They serve in the Auxiliary for the Greater Birmingham Humane Society. Our company Ambassador GB was adopted from GBHS by Bill and Melanie 5 years ago. GB's adoption prompted them to help find forever loving homes for all of God’s four legged furry creatures.